Get the authentic Jamaican collection! Notice my Yellow Scotch Bonnet pic from my garden. This is a real Scotch Bonnet not a yellow or orange habanero that others try and pass off as a Scotch Bonnet! Finding these seeds is hard because farmers in Jamaica just don't take the time to avoid cross pollination with other species. You get 10 seeds of the Scotch Bonnet and also 10 seeds of the Jamaican Chocolate Habanero a larger and hotter Chocolate Habanero than it's relative in Trinidad. But thats not all! Also you get 10 seeds of the Jamaican Red Mushroom Chile. 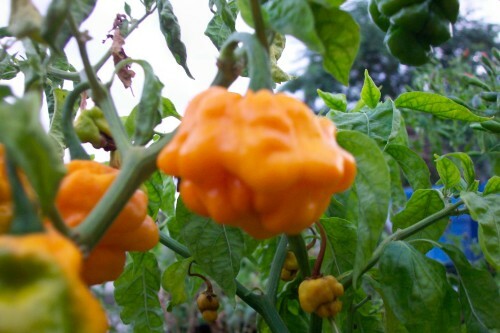 A Habanero type that has a real fruity flavor and grows huge mushroom shaped fruits. These seeds have been germination tested and have been grown organically in a pesticide free environment. Detailed germination instructions come with all seed orders.